Lieutenant General Samuel V. Wilson, U.S. Army (Retired), who served as Hampden-Sydney College's president from 1992 to 2000, has passed away. 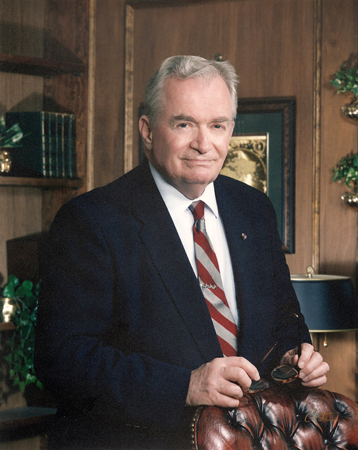 Lieutenant General Samuel V. Wilson, U.S. Army (Retired), who served as Hampden-Sydney College's president from 1992 to 2000, passed away today at his home in Rice, Va. He was 93. A public memorial service will be held at College Church in Hampden-Sydney, Va. on Friday, June 23, at 1 p.m.
"Hampden-Sydney College mourns the loss of this exemplary patriot and son of Virginia," said Hampden-Sydney President Larry Stimpert. "Our thoughts and prayers are with Susi and his family. In a period of great doubt, the College turned to Gen. Wilson to strengthen the foundation of this institution. In the pantheon of Hampden-Sydney men, perhaps no one is as beloved as 'General Sam.'" As president of Hampden-Sydney, Gen. Wilson guided the College out of a period of uncertainty with energetic, visible, and steady leadership. In the years before Gen. Wilson's presidency, enrollment growth had slowed, and Hampden-Sydney faced the question of coeducation. After an extensive examination of the issue, the Board of Trustees voted in 1996 to remain a men's college. 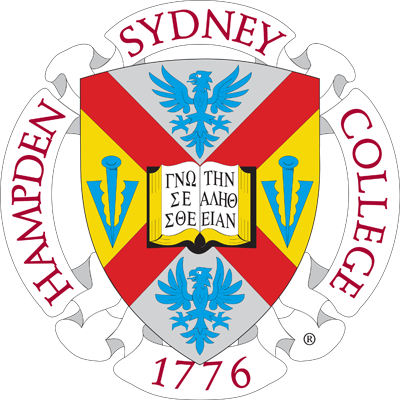 Under Gen. Wilson's leadership, the enrollment at Hampden-Sydney resumed growth and the endowment nearly doubled.As president, he also oversaw a number of symposia attracting national-level attention, and laid the foundation for the establishment of a center focusing on leadership and public service, now known as the Wilson Center for Leadership in the Public Interest at Hampden-Sydney College. A scenic nature trail on the Hampden-Sydney campus also bears his name: The Wilson Trail. In addition, Settle Hall - which houses the College's dining facility, Pannill Commons - was also opened, and fine arts became a full department with programs for majors. Gen. Wilson was also a spiritual leader and mentor to Hampden-Sydney men, teaching a Sunday school class throughout his tenure as president and opening his home to students for homemade meals with him and his wife, Susi. After graduating from Rice High School in 1940, Gen. Wilson was prepared to enter Hampden-Sydney College but chose instead to enlist in the Virginia National Guard as a private. He rose in the enlisted ranks and was selected for infantry officer candidate school, where he graduated at the head of his class. Combat duty with the legendary Merrill's Marauders in Southeast Asia was followed by a brilliant career in military intelligence, during which he attended graduate school at Columbia University. Later, as U.S. Defense Attaché to the Soviet Union, Gen. Wilson utilized his expertise in Russian language, history, and military strategy to visibly improve U.S. military relations with the Soviet military. General Sam’s legacy and character live on in the foundation of this College, and in the countless individuals worldwide he inspired to service and taught to lead. Gen. Wilson ultimately served as Deputy to the Director of Central Intelligence for the Intelligence Community, as well as Director of the Defense Intelligence Agency. He retired from the U.S. Army with the rank of Lieutenant General in 1977. Gen. Wilson's counsel was often sought by leaders including U.S. Presidents Nixon, Carter, Ford, and George H. W. Bush. His leadership and expertise was also essential in establishing an elite, dedicated counterterrorism unit and the legitimizing of special operations forces under a unified joint command. "We will be forever grateful to General Sam for his service to Hampden-Sydney and to this nation," President Stimpert added. "We will all miss his stories, counsel, and kindness. But, we also know that General Sam's legacy and character live on in the foundation of this College, and in the countless individuals worldwide he inspired to service and taught to lead." "It is now your world; it is not mine anymore. And it's a beautiful, blue jewel ... a shining sphere. Love it, cherish it, protect it and keep it."